I'm curious, how much can you fit inside? 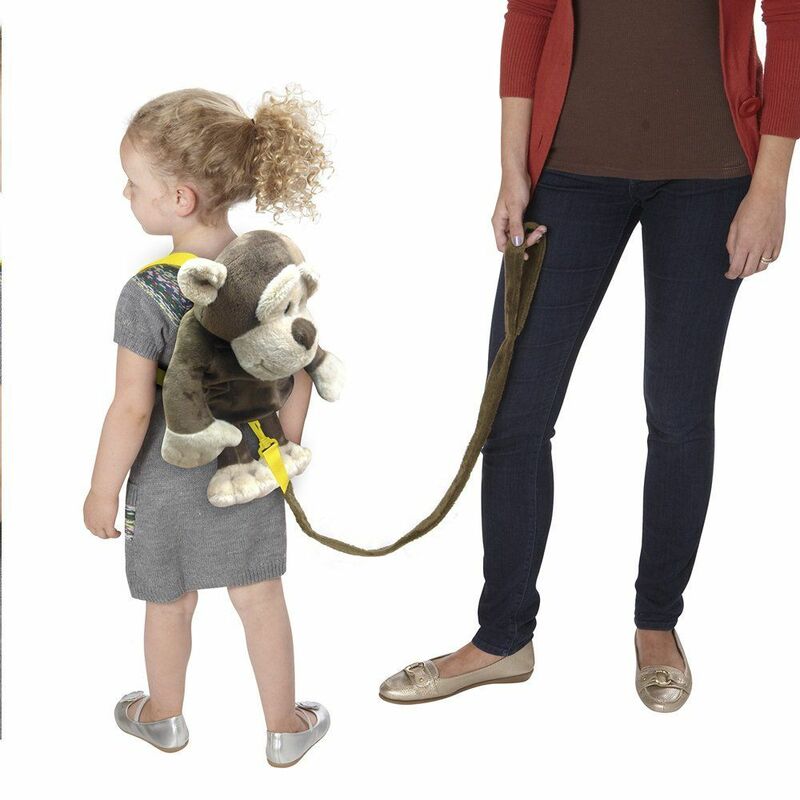 I immediately thought of monkey leashes for toddlers. I've seen them used at airports. 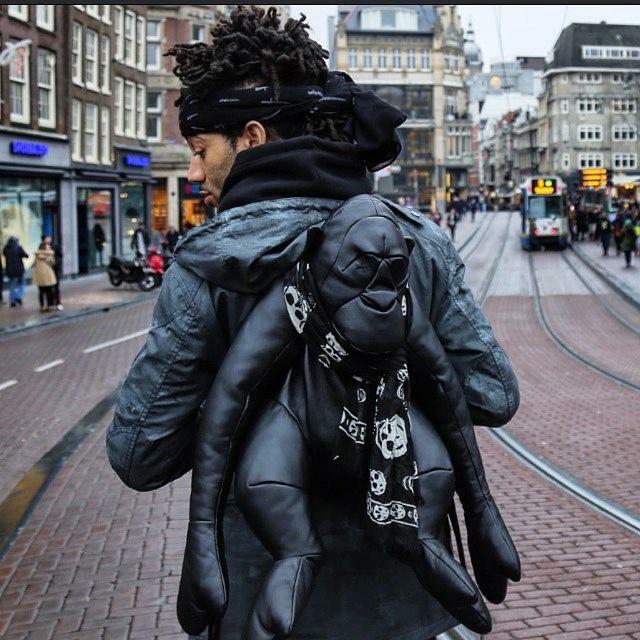 Your backpack, though, is indeed a work of art. To carry something like this successfully, you have to own it. If it makes you happy, why not! Just make sure it DOES make you happy. And isn't too heavy when you commute by bike -(the main mode of transport in the Netherlands). I really don't have any practical questions at all, because what he can carry seems almost beside the point. I'm not sure this kind of purchase is practical in any way. But I do have more emotional questions, several of which have already been asked. What's the happiness factor? Really high, as in through the roof? Continue. Can you really own this look? Yes? Continue. How comfortable are you being the center of attention? Very? Continue. What Angie said! If it makes you happy, and works for you, go for it! Life is too short to not wear what makes you happy! BTW, I think you are more than cool enough. Agreed with Vivian. I think it's totally cool, as long as it speaks to you and you love the idea of carrying it! It's an instant statement and conversation starter! I'm not sure if this is something to consider Liz, but maybe ask Mr. Edge. Greg and I hold hands out in public, and hug too. We like to be physically close. A bag like this would literally get in the way - since it's also about the size of me! Just putting that out there too. You're definitely cool enough, no question about that. But as viva says, how comfortable are you being the center of attention? I can see why you like it, it's fantastic! Ah you guys are always the best! Thanks for the feedback. Once you get past the head and the limbs, this is a well made lightweight backpack. It's fully lined, lightly quilted and it weighs less than a kilo. Straps are comfy with nice metallic clips. Astrid: I haven't loaded it up yet, but I'd say around 10l. It's the wrong shape for a laptop but it'll be fine for the rest of my kit. So, enough for a day out. JAileen: I'm mindful not only of the attention, but the messages implicit in "middle aged woman carries giant stuffed animal' Janet: conversation starter you say? That could go one of two ways around here. :D Dianna: it's very kind of you to say so, but it doesn't work unless I believe in it! Viva: you're right, this is not about practicality insofar as it's a collectable, so the bar is necessarily high. I wouldn't call it cheap, but neither is it breaking the bank. Xtabay: we had that conversation about buying fashion as art, after which I decided my rule of thumb has to be: as long as it's wearable. I love it for being more than just a backpack, but if I keep it I have to be happy taking it out once in a while. I confess I have trouble with it because " it" or " he" is rather anthropomorphized but does not look like " he" is comfortable or consenting ( him/it- self). Therefore it is creepier as a purse- backpack and puts me in mind of sci- fi dystopian societies. Why I don't have the same reaction to children's kitty, turtle or whatever backpacks, I do not know. I realize that's not the same analysis as why not/ what is your love level, but there you have it. Just throwing that out there. Other folks are likely better at separating reality from art. ^ This was my first thought, too. 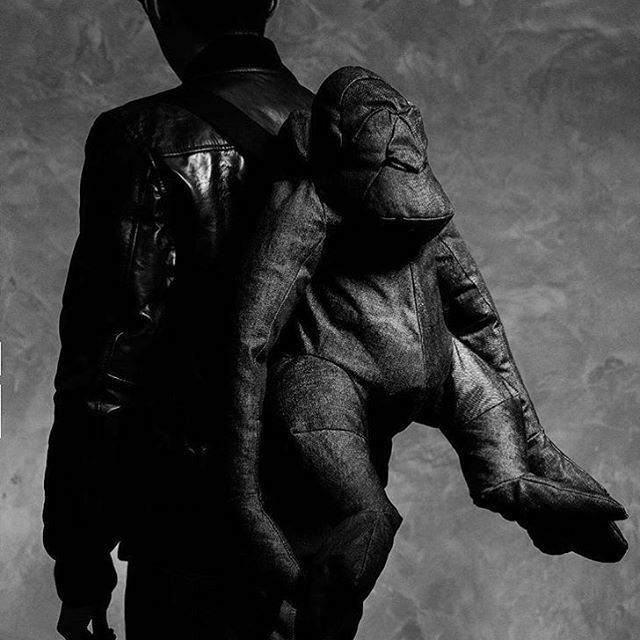 Despite it being an ape, "monkey on your back" was the first thing that came to mind, so if you buy, be prepared for people to approach you with bad puns on the regular. On the other hand, there are things I own that I rarely even wear/carry that were not inexpensive and I still do not regret buying. I simply love them that much. If this item fits into that category, you will likely regret it as "the one that got away" forever. I'd at least buy and see how the two of you get along and go from there. On the other hand, now I'm imagining an outfit with this and the Ann D's as focal points. I'm not in a position to dissuade anyone from carrying objects that invite misinterpretation and require conversation to explain. Repeatedly. unfrumped that's a brilliant point, thank you! One of the reasons this works for me is this deep ambivalence it inspires. It's a toy, you want to play with it, but it's slightly dangerous at the same time. Maybe there's a desire not only to anthropomorphise, but also confer some agency, or even appease it. I think this is maybe a natural reaction - here's another one wearing a scarf. minimalist, echo, of course I'm the queen of bad puns, so I'm more than comfortable with that. And you're not the only ones to notice either. I may well accessorise with dark glasses and a scowl though, so as not to encourage too much unwanted attention. Ha ha, you're going to frighten small children with your bag and scowl! Have some lollipops handy, just to reassure them. One shoulder all the way!!!!! Shock Liz! My first reaction was that it's not you. I don't know you at all well, but feel you look very arty in a cool way. This just seems odd and not the same SORT of cool, she says inarticulately. I think he's wackadoodle in the best possible way. definitely not an everyday bag but you know that already. My first reaction was "oh no", but I'm fast warming up to the little guy. I checked CR's website and now I want a bunny--or maybe the pup--or even a fish clutch! Instead of dark glasses and a scowl, I'd domesticate my monkey with a pink scarf--maybe printed with little skulls? If I was still teaching at the university, I'd use him to carry my stuff to class and pop him in a front seat with his own textbook. He's hilarious! 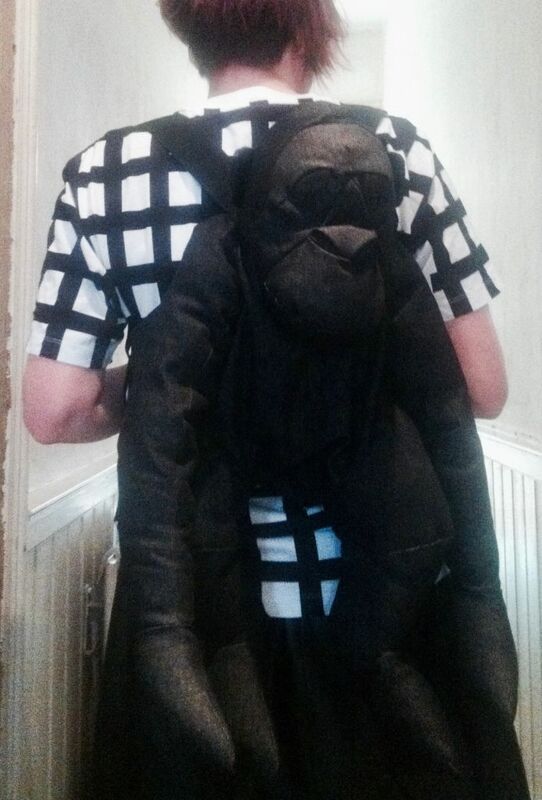 And who would mess with an old lady with a monkey on her back? This takes bags as a "wardrobe pet" to a whole new level. I love the whimsy of this and think that it is very grown up. If anyone could pull this off, it is you. However, I am partial to items like this - and have a monster bag myself (in finds). I get lots of compliments on my bag, because it is fun. Would I wear it? Probably not, as the last thing I am looking for is a reason for people to start conversations with me. So if I passed someone wearing this, I would notice! Then I would want to see it up close. I might even approach you and ask about it. It's interesting and I think it's kind of funny in a cool and edgy way. If you love it and think you will use it, then it's a keeper. I do like the picture of the man wearing it with the scarf. He is owning it to perfection. It is a cool piece. This is definitively having fun with fashion. Xtabay: hehe and I can come up a few "moves" for his arms and legs to make it even weirder! JenniNZ: hence the question! But it's all in the where and how. I think I'll wear it among friends to begin with, safety in numbers and all that. rachylou: I'd say that's the perfect qualification to answer this question! If a kangaroo pack is useful, then so is a great ape. Bijou: that monster is fab! I'd totally carry that. Go Team Whimsical Carriers! Gaylene: I would love to bring this to class! But unfortunately it can't take my laptop which I need for taking notes, so that's out. I have a nice scarf for him (b/w almost-gingham plaid) but he'll be going commando until we're properly acquainted. Cindy, SF, Diana, shevia, Deborah: thanks for the vote of confidence! The problem is figuring out where and how to wear this successfully, because there are no practical issues other than flailing limbs :D Otherwise, this is a rather excellent backpack. I would love to make a video of you walking around with it, and seeing the reactions. Everyone is going to want to know this bad boy. He looks like he could almost talk. Yes, keep. And I think you should make a point of carrying it with more than "minimal black and white looks." I echo Shevia! Is it only the trunk that you can fill? Maybe purchasing an iPad to replace your laptop is in order. Hope you keep! I am so intrigued! There is something very artsy about this. The simplicity and texture without other details (such as fur and facial features) make it read more sculptural and less stufffed animal. Wearing this with sharp, simple, edgy outfits will make people stop and pay attention. It may first get a laugh, but I'm guessing the followup emotions will be admiration and legitimate interest. I CANT WAIT to see outfits... So. Cool. Awesome. And yes you are cool enough.